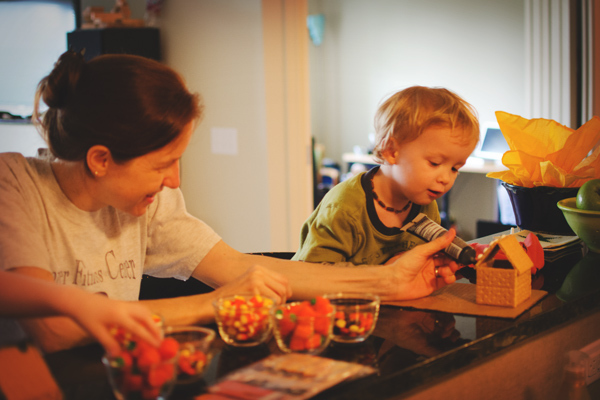 It’s that time of year…special candy, festive decorations, and family crafts as far as the eye can see. 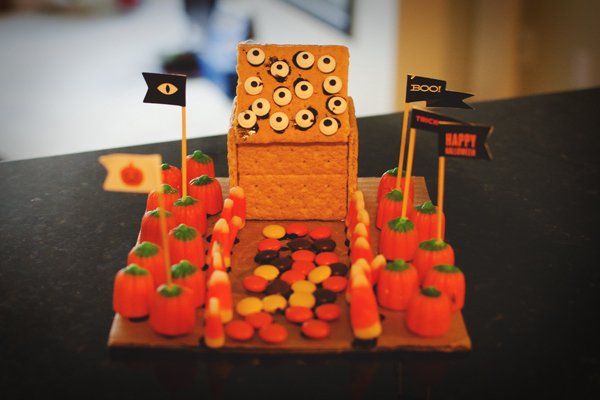 This year, we decided to make Haunted Houses (think Gingerbread Houses, but for Halloween). So we hit up our local Target to see what they had for us. Full disclosure: It was late August, and the answer was “not much.” But I did what I could and lucked out with some candy corn and pumpkins by the register. Obviously – you can pick your own ingredients (I was really hoping for some marshmallow ghosts and spider webbing), but this is a good jumping-off point. Walter was very specific about placement. I let the boys color on their cardboard lots while I hot glued their houses together, then I glued the houses to the cardboard and we all twiddled our thumbs for a bit. I took the opportunity to put the candies in their own bowls, making sure that each boy got a bowl of each candy. Then I gave basic instructions on how to use the icing like glue and I let Baz do his own entirely while I placed icing drops for Walter. I let him point, I squeezed out some icing, and then he placed his candy of choice. It was quick enough that I didn’t get bored, but involved enough for the boys to enjoy themselves. All in all, a very fun little craft. Happy haunting! 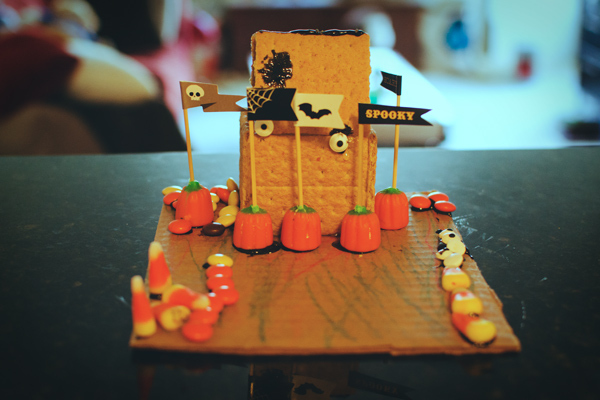 Wow, the haunted house turned out so well!